Let’s get right to it. Pilcro and the letterpress bag by Anthropologie that I found at Clothes Mentor a couple of years ago. I love yellow bags but i have a great one that serves my purpose so even though this is 1. a favorite bag color 2. pebbled leather 3. has a cool accessory I’m letting it go right out of the gate so i don’t change my mind. This is a good sized bag and will fit all of your essentials and a small umbrella or – you know my baseline – a water bottle and a magazine. Off to read at our Ash Wednesday service – Jaiya acolytes so – McKenneys in the house. 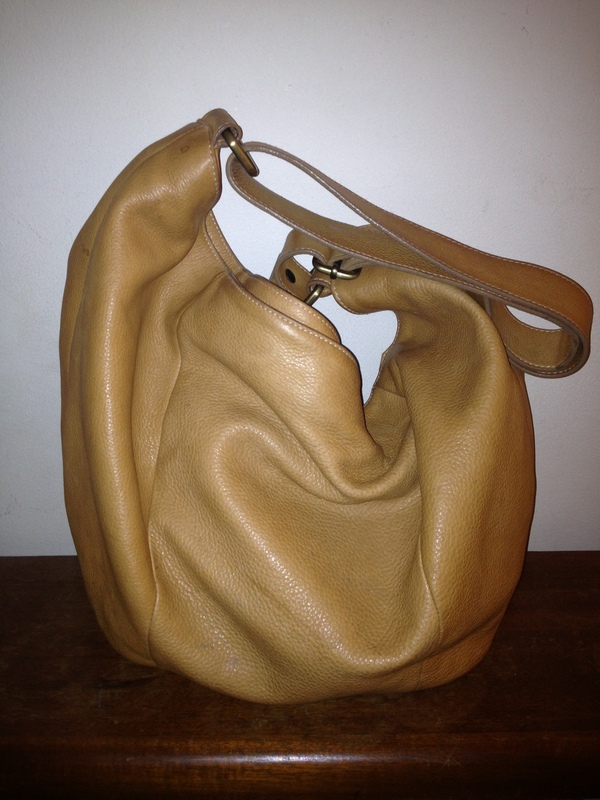 Email me at 50favbags@gmail.com with Bag 1 if you want this bag. This entry was posted in 2019 Lent Bag Giveaway, various places and tagged pebbled leather, pilcro and the letterpress, yellow on March 6, 2019 by miriamgmck. 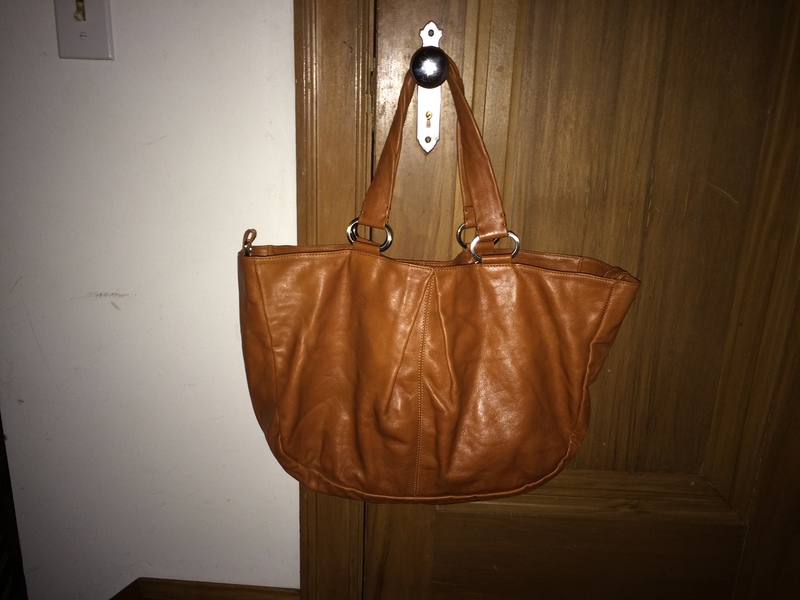 When I saw this bag Clothes Mentor, I admired it but left it in the store. But I was intrigued when it was still there a couple more times after that. Pilcro and the letterpress? Never heard of it. Did my research and found out it’s an Anthropologie brand. You see how it worked out. After black and red, yellow is a great color to invest in. 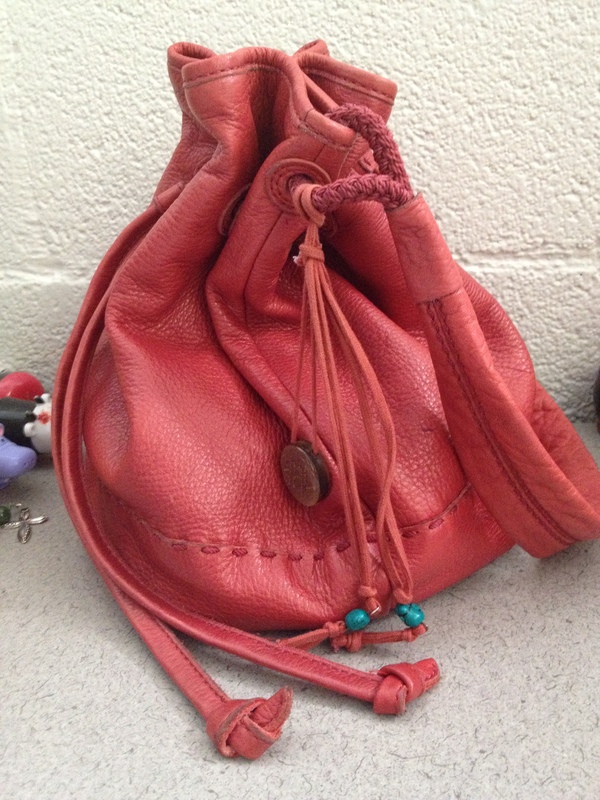 If you love a color but it looks… well… not so great on you, get the bag. This entry was posted in various places and tagged Clothes Mentor, Leather, pilcro and the letterpress, yellow on May 4, 2018 by miriamgmck. this bag was my 2012 Christmas present to me from my family – which means i picked it out, bought it, kept it in a bag under the bed and then put it under the tree on Christmas. what an awesome gift – exactly what i wanted. no, i didn’t get it at my favorite goodwill, or any thrift store. this came from the one, the only, tj maxx. while it is always my dream to score quality bags at thrift store prices, that doesn’t always work when i have something specific in mind. 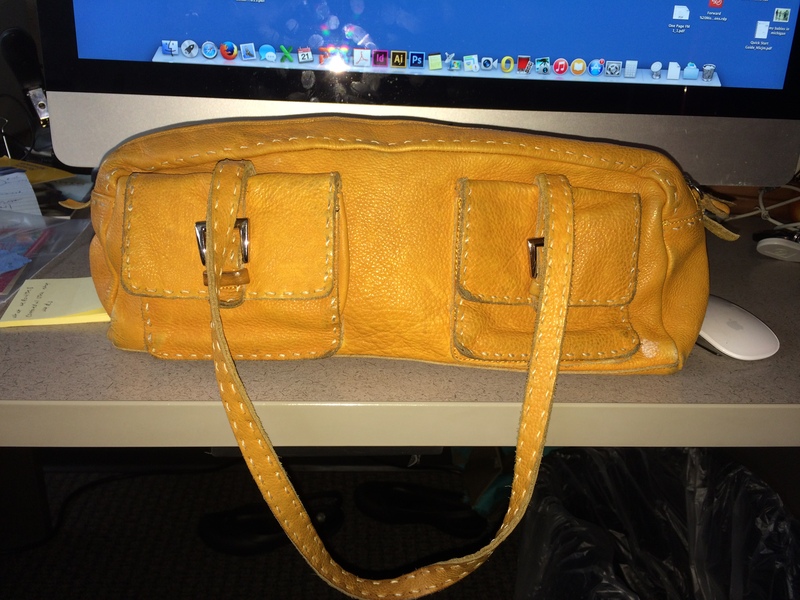 a few years ago, my close friend and 2nd mom joy wanted a yellow/mustard bag. she knew if anyone could find it, i could. she is very particular and won’t settle for just any style. 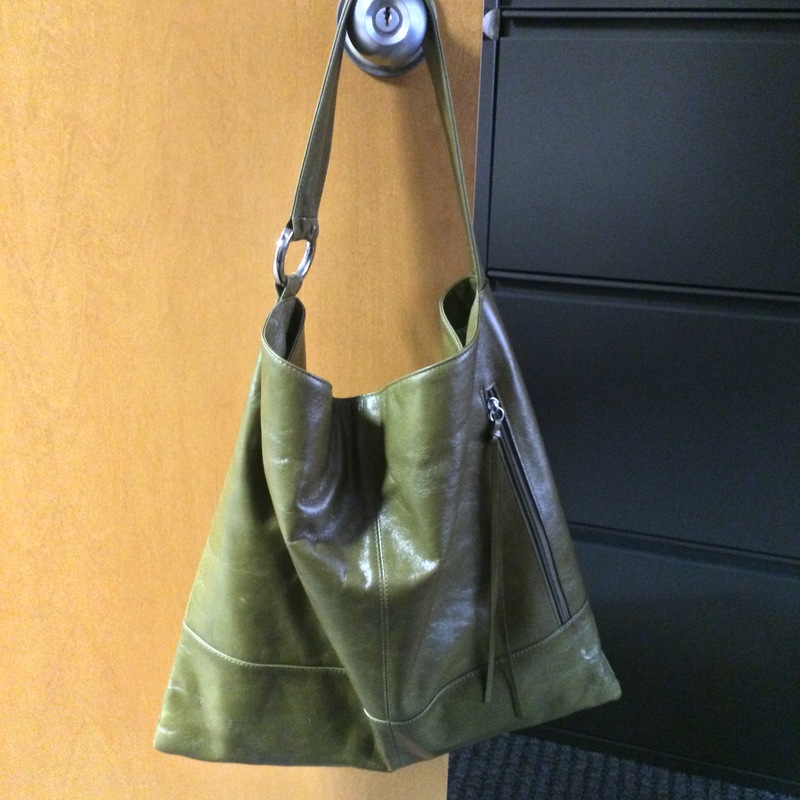 well, i found her a london fog mustard colored purse for $70. instead of telling her about it, i splurged and bought it for as a birthday present. it barely begins to compensate for all the times she was there for me when i got locked out of the house, felt like no one understood me, and didn’t understand myself. i was thrilled to give it to her and she was beyond excited. 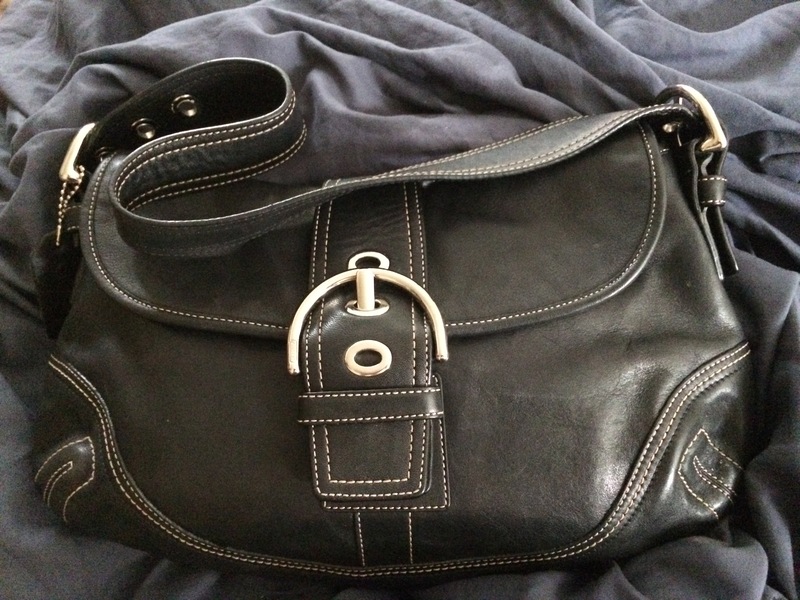 i loved the bag myself – so much that i went online and got myself one from overstock.com. 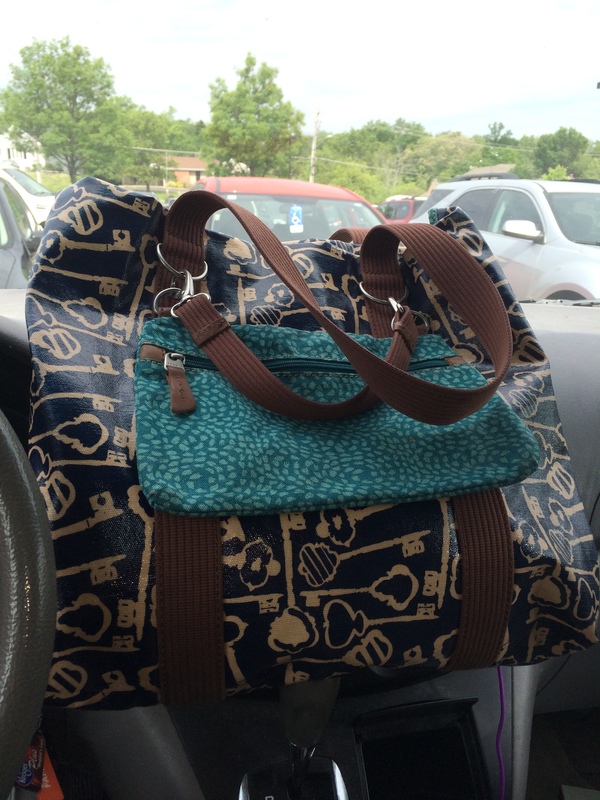 if you find something you like at tj maxx and don’t buy it, then go back and it’s gone, try overstock or polyvore. so i got my yellow bag and i basically wore it out. the body is leather but the handles are covered in a thin, stretchy vinyl – the handles began to peel and that’s it for me. i can’t be too tacky. so i started looking for a replacement last fall – and i looked for months and months. 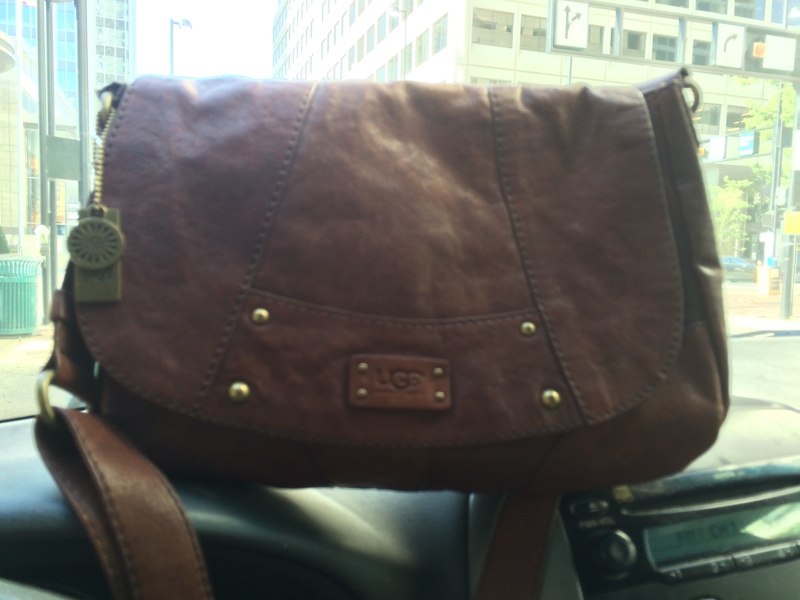 everything i liked was way out of my price range – i have this innate ability to select bags that cost $129 or more. not happening! 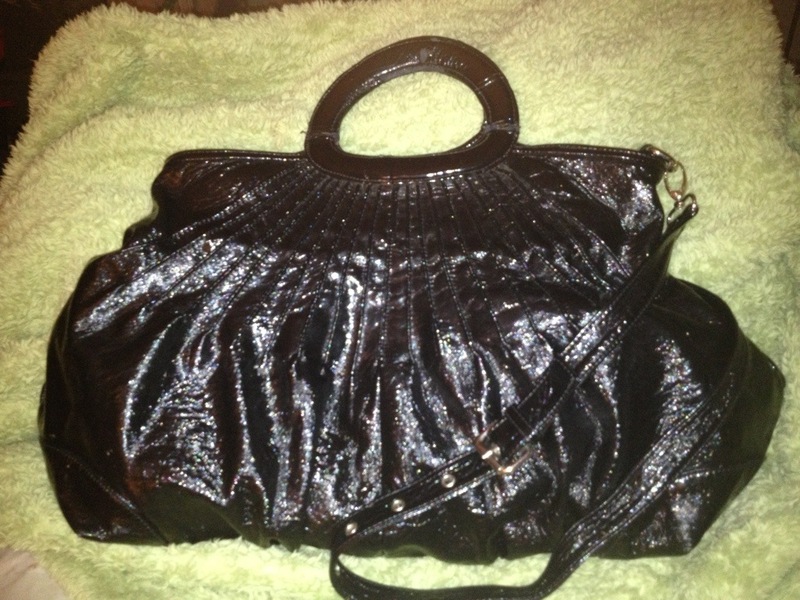 i found this bag by the sak at tj maxx for $60. well, $59.99 but who’s counting. as a present, i felt i could justify coughing up the dough. 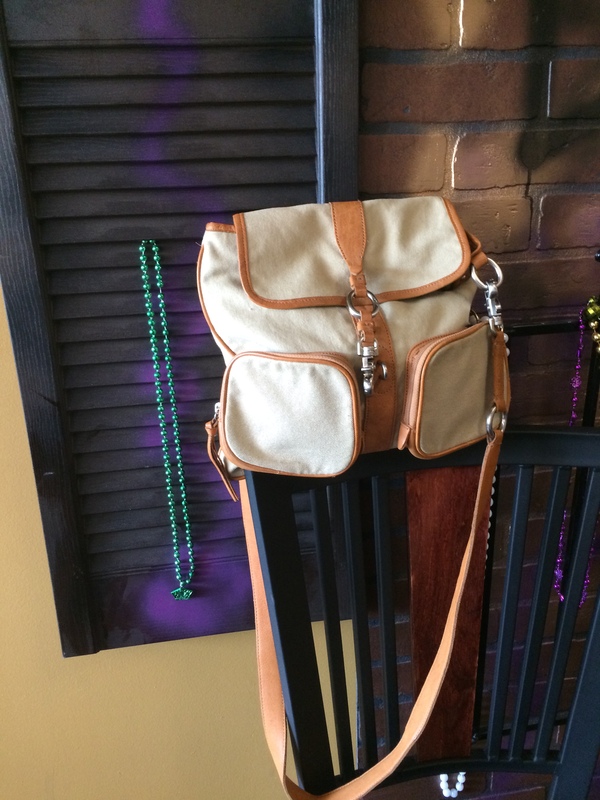 it’s a satchel that converts to a hobo; the shoulder strap folds underneath the purse and can be snapped into immobility. the pebbled leather is buttery goodness and i have to work hard to not just sit and pet it like a cat. what can i say, i have two kids with asthma. no pets. i loved this gift. 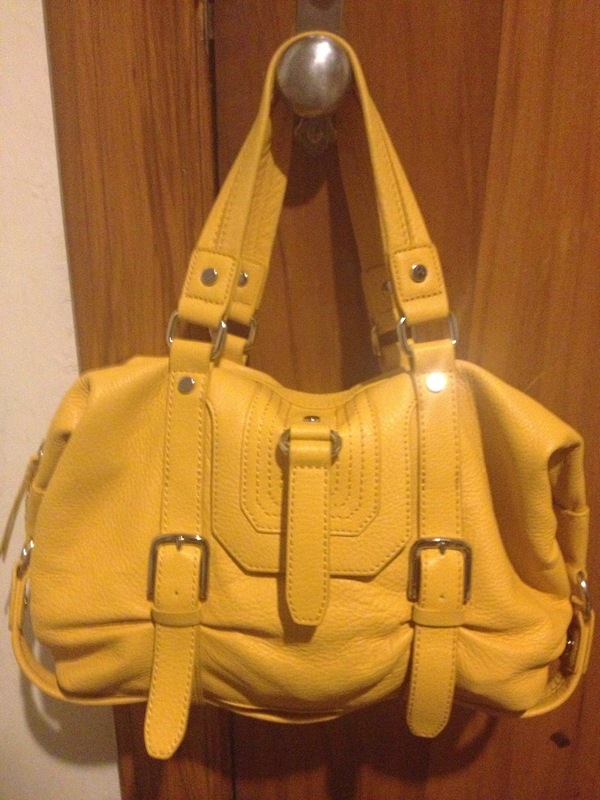 having a yellow bag on a rainy or winter’s day brightens not only my mood, but others’ too. it’s the least i can do. 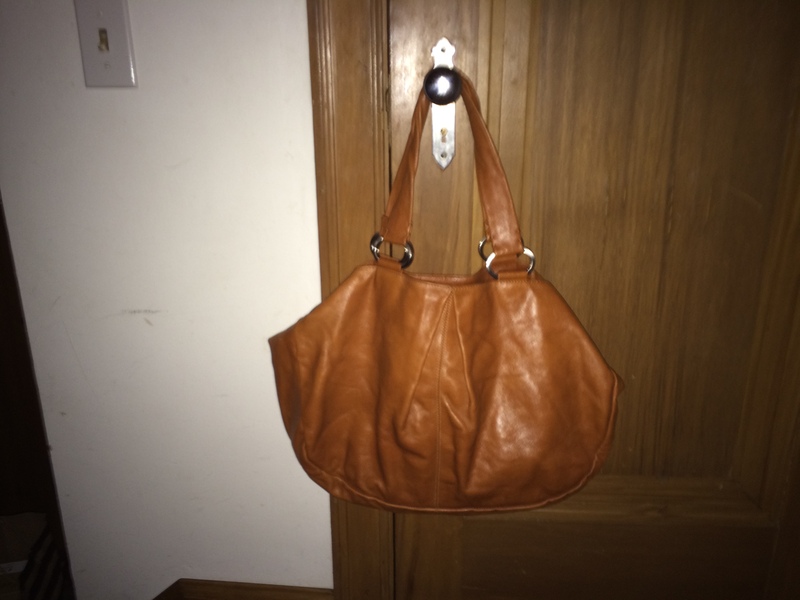 This entry was posted in tj maxx and tagged Christmas, friends, Handbags and Purses, Leather, present, Shopping, the sak, tj maxx, yellow on May 16, 2013 by miriamgmck. my eddie bauer backpack comes to the rescue once again. my brown leather laptop bag’s strap broke, so i went to my old standby. it takes a licking and keeps on hauling all of my stuff. 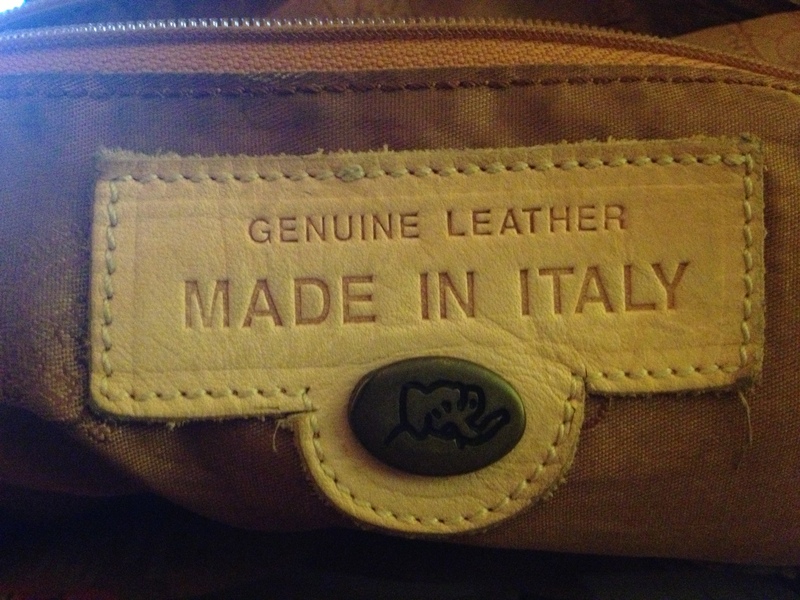 i remember getting this at the eddie bauer outlet store in jeffersonville, oh several years ago – maybe 10 or more – because i loved the color. while green is my favorite, and i love purple too, there’s nothing like mustard or yellow to brighten my mood. when my oldest n was a toddler, she was diagnosed with asthma. i read that yellow is good for asthmatics in some book about decorating with color. i can’t remember why, and i didn’t mention it to her. when we moved into our house a couple of years later, she announced that she wanted to paint her room yellow. so we did! i don’t know if it helped her asthma or not, but i can’t say that it hurt. within three years, her symptoms were virtually nonexistent. we never repainted the room. i don’t mess with stuff like that. so i’m home again, after several long and productive days. 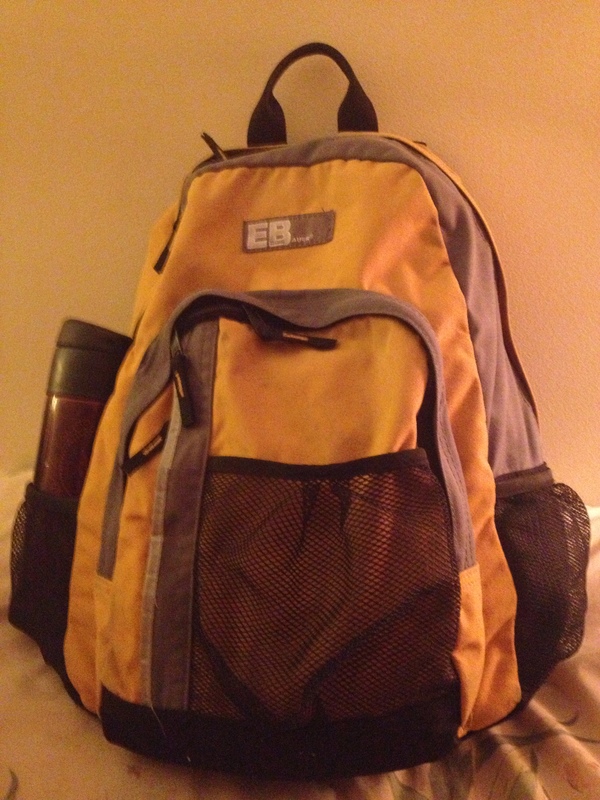 so this photo is of the bag where i will soon be – in my bed, hitting a z. thanks be to God. peace. This entry was posted in various places and tagged Allergy, Asthma, backpack, eddie bauer, Health, home, yellow on April 24, 2013 by miriamgmck.